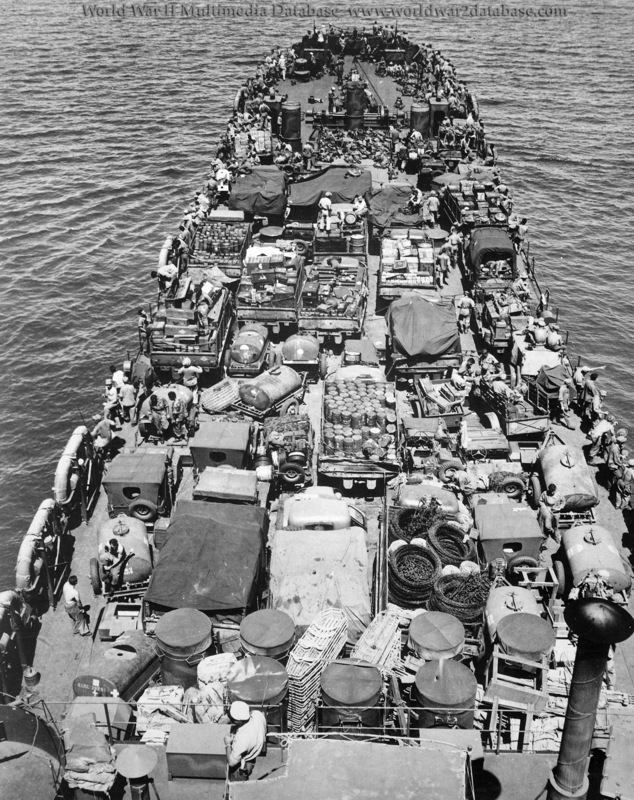 "Crammed with men and material for the invasion, this Coast Guard-manned LST nears the Japanese held shore." Troops shown in the picture are leathernecks from the 1st Marine Division. On Decembert 26, 1943, two days later, the 1st Marine Division landed on Cape Gloucester, New Britain using Coast Guard-manned LST’s 18, 22, 66, 67, 68, 168, 202, 204, and 206, and many other US Navy ships. The LST-22 shot down a Japanese "Val" dive bomber while LST-66 was officially credited with downing three enemy aircraft. Two of her crew were killed by near misses. LST-67 brought down one Japanese dive bomber while LST-204 shot down two and the gunners aboard LST-68 claimed another. The LST-202 claimed three enemy planes shot down. 76 LSTs were crewed by the Coast Guard during World War II.